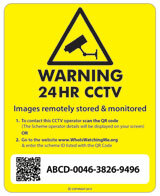 Every “whoiswatchingme” sign & sticker is printed with a unique serial number that allow CCTV owners to register their signage so that a member of public can identify and contact the CCTV Scheme operator. Essential in helping ensure the Scheme complies with the data protection act. When a member of public or police need to contact the CCTV Scheme operator they simply make a note of the serial number & web address on the sign and they enter it in to the “Lookup” page on this website, this instantly gives them the CCTV Scheme operator contact details. *Private households are not bound by the Data Protection Act 1998.